My relationship with the 1970’s has had its ups and downs. While I never met the decade personally, I’ve lived in many of that were influenced by it. When I was young, I regarded the 70’s as object of ridicule, a time when fashion and films were at a low. The movies were often grainy, dingy and unpolished. The women were all anorexic. The men all had mustaches. My opinion changed (somewhat) as I grew older. I came to appreciate the artistic innovations, the rise of low-budget indie films, the cultural upheaval and the music. I still can’t stand the fashion, but at least I’m on better terms with the 70’s. My love of the giallo, which experienced its heyday in the decade, largely contributed to the turnaround. But the giallo had faded fast as the decade waned and the 1980’s saw a surge of a whole new type of horror film: the special effects vehicle. Serial killers and men dressed in monster costumes were out. Slime-spewing animatronic robo-goblin-aliens were in. As a creature of the 80’s myself, I can’t help but love those hideous technological wonders. They represented an era of gruesome ingenuity and low-brow revelry with a charm of its own; when eyes weren’t being gouged out, they were winking at us. 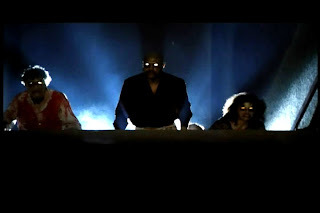 Italian horror easily adapted to the new climate and what better example of 80’s cinematic magic than Lamberto Bava’s “Demons” (1986), written and produced by Dario Argento. 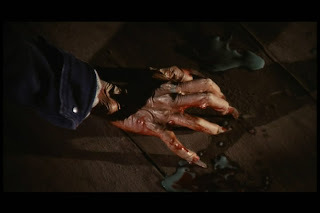 Lamberto, the son of the great Mario Bava, makes up for the talent he failed to inherit with effects that are gleefully repulsive, scoring shrieks and retches with everything from throbbing pustules to bursting demon-spawn. The plot of “Demons” is pretty simple: demons kill theatergoers. It begins with Cheryl arriving in Berlin and immediately sensing a stalker. The perpetrator is no killer, despite his half-metal face (yeah, I don’t know), but a man handing out free movie tickets. 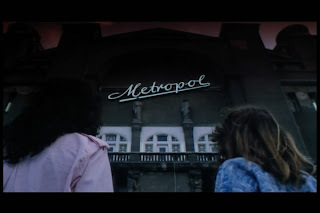 The film has no title and is playing in a theater, the Metropol, that has been shut down for years, but that doesn’t stop the enthusiastic Cheryl from skipping class to attend. The venue is a mildly menacing sight from the outside, but it’s within that the kickin’ 80’s awesomeness (and later the blood-splattering terror) begins. The centerpiece of the lobby is a headless samurai driving a motorcycle with a katana in one hand and a creepy demon mask in the other. As Cheryl flirts with a pair of Italian cheesballs, a pimp and his two women horse around by the manikin. One of the prostitutes tries on the mask and gets a small nick on her cheek. The movie turns out to be a tiresome low-budget horror film involving the tomb of Nostradamus. Ironically, the audience makes fun of the bad acting. 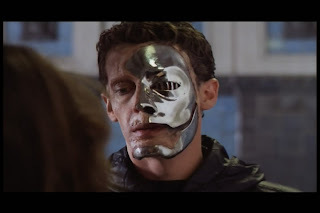 When a character in the movie tries on a mask (the same as in the lobby) and gets a tiny cut and the on-looking prostitute gets understandably nervous. She excuses herself to the restroom and soon finds herself transformed into a bloodthirsty demon that vomits green slime and has enormous teeth… just like in the movie! Go figure. The carnage escalates with murderous abandon. 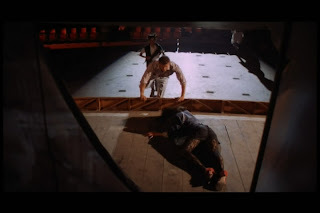 In one of the best scenes, the movie-in-the-movie is showing a killer tearing down the outside of a tent with a knife destined for the throat of a screaming damsel. From behind the screen, one of the demon’s first victim is crying for help and trying to break through the canvas. Her screams are mistaken for the movie’s audio and her pressure on the screen only looks like an intentional distortion. 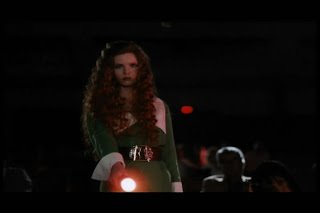 She is killed at the very moment she bursts onto the stage, simultaneous with the onscreen knife slitting open the tent. She soon rises up, now transformed into a red-veined, orange-eyed beastie. The metaphor of cinema giving hideous birth to unspeakable evil is a sly stab and gentle nod to horror film detractors. From here on out, the whole movie-horror-meets-real-horror is quickly done away with and any thematic leverage is discarded in favor of elaborately staged death scenes. You get your classic 80’s-style slaughter of brainless, unsympathetic characters who are doomed from act one, but take an hour+ to finish fleeing, screaming and dying. 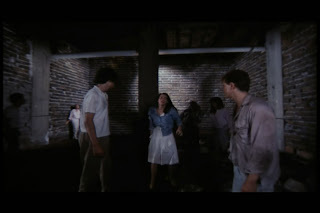 It should go without saying that everyone is trapped in the theater (the doors turn out to be solid walls) and though no one can get out, a fresh injection of new victims (in the form of drug-abusing punks led by a Sylvester Stallone look-alike) are eventually allowed to restock the demon-fodder. The script is largely awful, but much attention and love has been put into the makeup and special effects. Many of the demon visages have withstood the test of time, and easily outdo the armies of zombie/monster/hellspawn creatures of the period. Each demon is unique in its own way while remaining highly unified as a cohesive villainy that spreads like a virus and kills in a storm of gore and viscera. It’s often gross, but somehow fun. The whole ordeal is so enthusiastically over-the-top and emotion-free, that the audience will inevitably spend more time marveling than cowering. The story is dull and clearly patched together from a handful of mediocre ideas, the best of which is the horror-movie-come-alive suggestion that rapidly peters out. 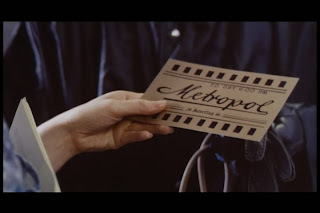 The collection of movie posters in the lobby, including Herzog’s “Nosferatu” (1979), Argento’s “Four Flies on Grey Velvet” (1971) and “Metropolis” (1927) testify to some of its influences, as does Lamberto’s pale mimicry of his father’s colored lighting. The director, writers and actors rarely get anything right, however, and yet somehow succeed by sticking steadfastly to their predictable premise. The liberal dousing of kills and action set pieces do their best to make up for the lack of locations and story ideas. One particularly desperate moment has a wide-angle lens in a bare room getting used to make things look claustrophobic. It sort of works. At least Bava overcomes the fact that neither he nor the audience is invested enough in the characters to care whether they live or die by endlessly outdoing himself with ever more demons and craziness. 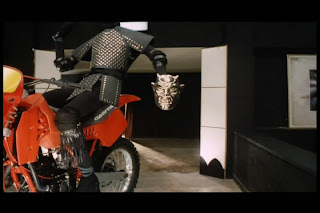 The culmination, which involves a motorcycle rampage, a helicopter and a demonic apocalypse, is satisfying in its 80’s adolescent indulgence. To finish things off in high style is an epilogue that widens the scope significantly and a little post-credit surprise. Outside of the SFX, the film really shines in terms of music. The hard rock soundtrack features Claudio Simonetti (formerly of Goblin), Pretty Maids, Motley Crue and Billy Idol. The music is loud, like the acting, and really gets the blood pumping. Though the whole thing is already dripping in 80’s kitsch, the music really ties the knot. That tracks actually fit well and sound polished so if you are into screeching electric guitar riots, this one should not be missed. The comment about the actress not even speaking but somehow being the worst actress of all time made me laugh out loud! I am intrigued. I swear to god, she has the worst nervous over-the-shoulder glance that I can recall. At least Fenech would have allayed the lame gesture with a melodramatic hair flip or her trademark gasps. This actress seemed liked she was looking around for the director to give her some stage directons. I should mention that even if this movie were twice as bad, it would still be worth seeing. In fact, if it were twice as bad it might be even better! You shouldn't have! That is one of my favorites. I don't own it yet, but I will. and here I was, thinking, 'wow, i haven't checked in on Brian's blog in ages,' and look what you reviewed!! i think this was my first foray into Italian horror of any kind (though I do generally like the 70s stuff better), and it somehow left me wanting more. if you actually want something twice as bad, you should check out its sequel, Demons 2. I will likely give the other Demon films a go eventually, but they have a rather bad name (as you know). It is hard to claim that even the original is a great film, but it does do an admirable job smearing the 70's genre with 80's atmosphere, commercial values, youth culture, special effects and hair. I've already got another Lamberto Bava film to review, if I can make the time. So can anyone explain the helicopter ? I didn't really get the helicopter either. Was it a rescue mission? A news copter shot down by the spreading outbreak outside? I like to think that it's the helicopter from the end of "Dawn of the Dead" (the original) and that all the survivors from the zombies in that film die tragically by crashing and then being devoured by demons. 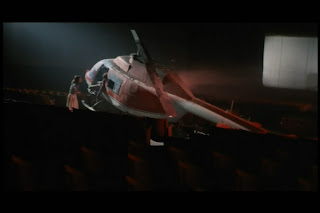 I think the movie shown in the cinema is supposed to explain the helicopter, but I never got the explanation. Review of Where Is the Friend's Home?